One of the things I have found since becoming a ‘blogger’ (I still find it odd calling myself that) is that there are huge variations in opinions of sponsored posts and reviewing items. Some bloggers blog as their job and will need to make money from what they write and I am totally for any of my fellow bloggers who are on this path. In fact I take my hat off to you, throw confetti at you and in general think you are pretty amazing. I however am not one of these bloggers, I am just someone who writes a bit about their life, children, home and various other bits and pieces I love. One of those things as you know is cows. I have loved them ever since we moved into our home and shared the bottom of the garden with a giant herd of dairy cows. 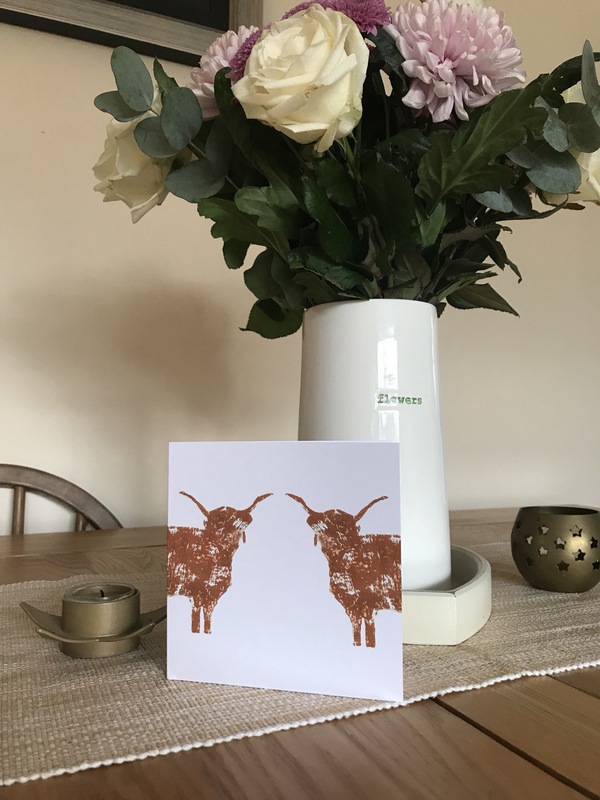 I have written in the past about how they have inspired a theme around my home and how we love to hunt for cow themed interior products. Yes I am well aware of how rock and roll I sound right now! 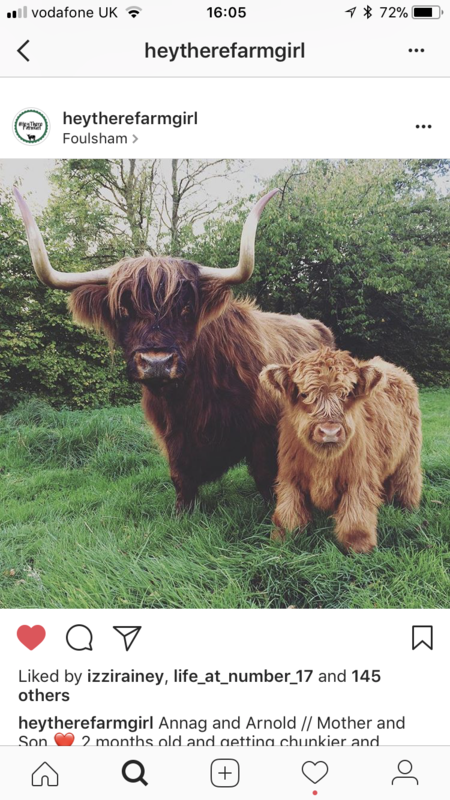 Over on my Instagram page sometime ago I started following an account called ‘Hey There Farm Girl’ purely for the amazingly cute Highland Cows that they have on their farm in Norfolk. Arnold is my favourite, I would have him here if I could though I’m not sure he would be too keen on the boys and their lego! If you haven’t followed the account you really should just for the daily gooey happy feeling the gorgeous animals give! 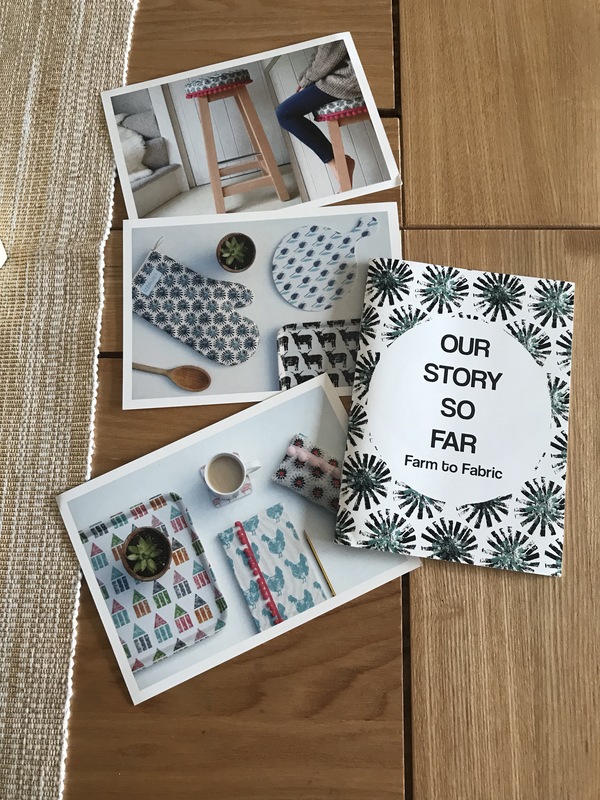 When I was contacted by their linked account ‘IzzyRainey’ I was interested to hear more about them so they sent me a little book called ‘Farm to Fabric’ which explained all about Izzi and Lara who are best friends who have set up their own textile company based on Izzi’s family farm in Norfolk. Not only was I massively impressed but also hugely jealous that they get to work with their best friend and alongside the farm animals and my beloved Arnold. When I looked into their beautiful hand stamped creations I fell in love with them. 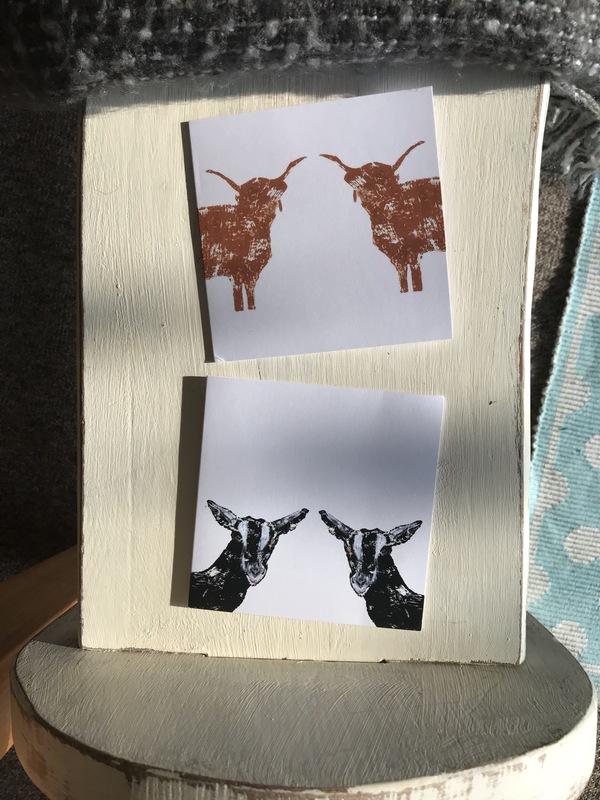 Not just because of how gorgeous their products are but also because they make all manner of highland cow stamped creations such as bags, cards, chopping boards, trays, oven gloves, tea towels and even jewellery. 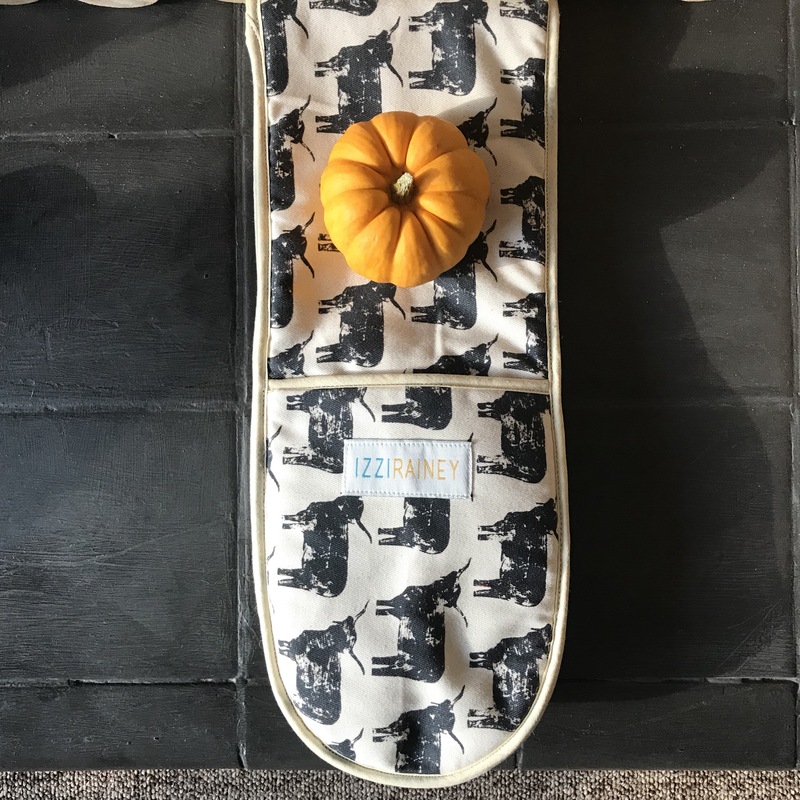 I think Izzy and Lara realised from all my gushy comments about the farm and the cows that I was a bit cow obsessed so very kindly sent me a beautiful oven glove and tea towel stamped with their gorgeous highland cow design. 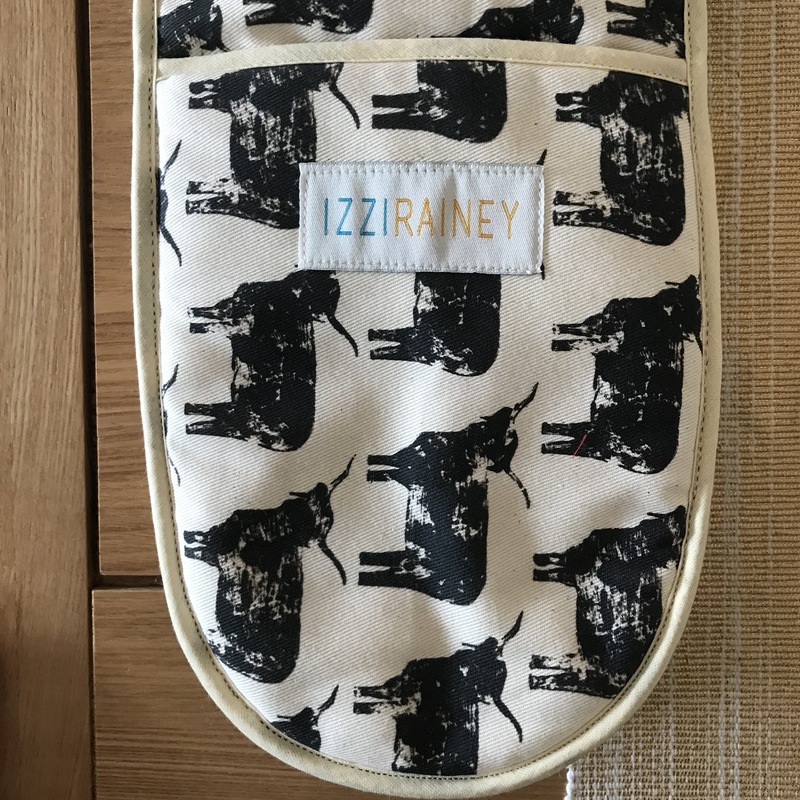 If you fancy having a look at all the lovely things they have to offer you can visit IzziRainey here. They can also be found at a variety of stockists across the UK and at country fairs. 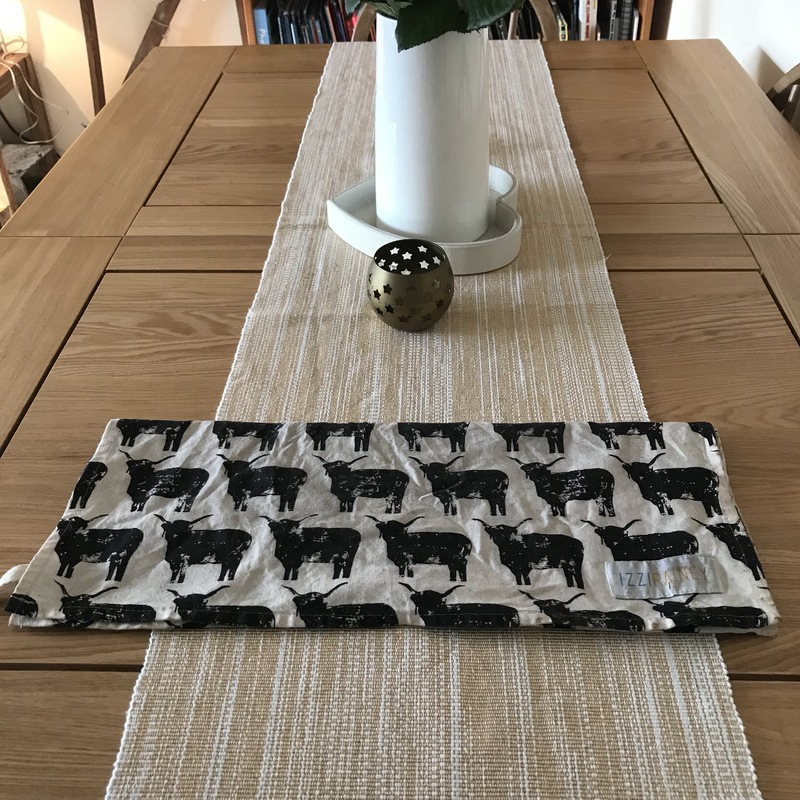 I have promised myself we will will visit not only to meet the lovely Izzi and Lara and to see their studio but also to meet their gorgeous cows! Hey all, how are you? I am in a typical me fashion feeling low again, I imagine the weather changing, a really busy week and general grown up stresses are to blame. I also genuinely think I might be going through early menopause as having had a hysterectomy even with keeping my ovaries I’m at a greater risk of it coming within five years of the op. I am going to the doctor tomorrow who I’m sure will put his head in his hands when he sees me screaming inside his head ‘not her again!’ Anyway, being a bit low I’ve been feeling massively tired, so much so that this afternoon while snuggling with the boys on the sofa watching ‘Percy Jackson the Lightning Thief’ for the seven millionth time (that’s just today) I fell asleep. I woke up two hours later (neither boy had moved) to a missed call from one of my best friends so I got up in a slightly dazed and confused state to put the kettle on (who doesn’t need tea when they have just woken up?!) 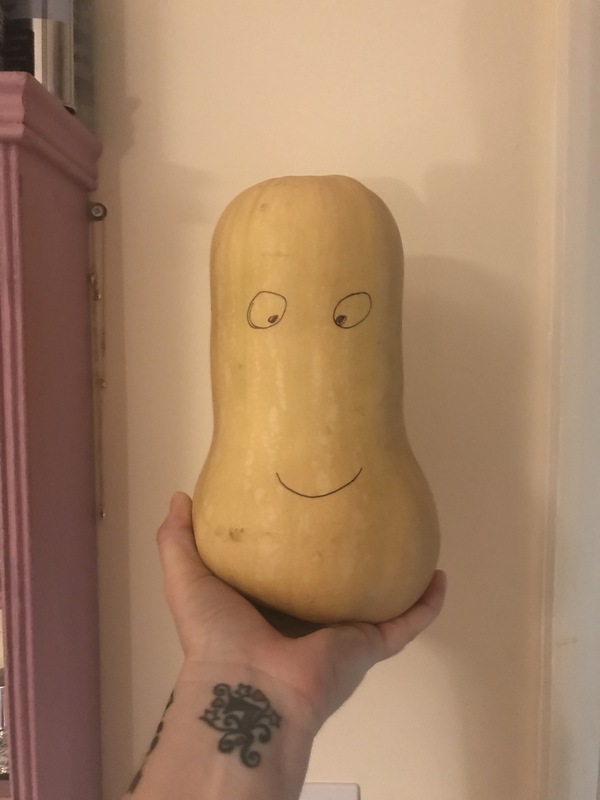 and called her as I walked into the kitchen. Not really aware of what was going on I went to the fridge and heard a noise behind me. 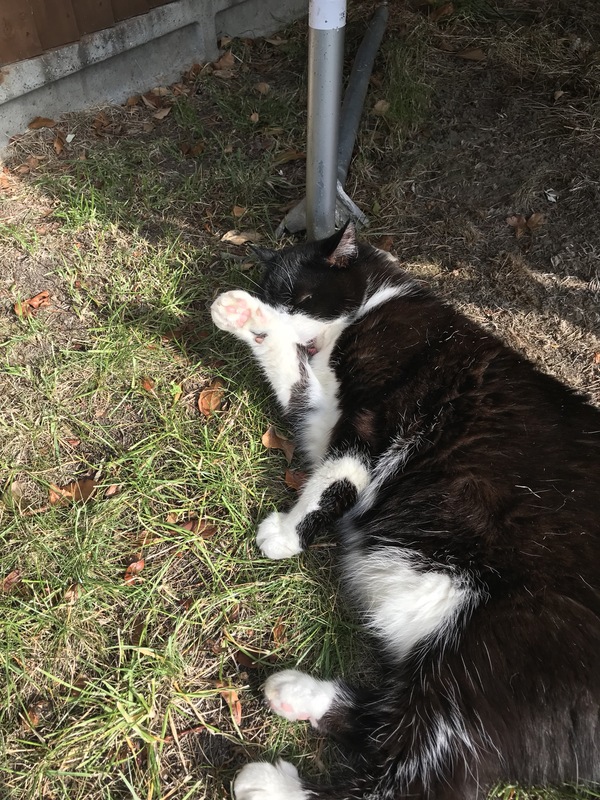 This was Alf our black and white cat who is about fifteen and should be acting his age however he still thinks he is a kitten. The next thing I knew a brown lump fling itself across the kitchen floor. I jumped and almost hit the ceiling and was screaming down the phone to my poor friend who I assume thought I was being murdered or having a serious episode. It was a mouse, a live mouse that Alf was tossing around the kitchen like a juggler. I ran from the room, shut the door and continued to scream down the phone to my friend who by Now was in hysterics. She has been called to help me with spiders before and knows how much of a wuss I am. So the boys who being boys should have been saying, ‘it’s alright Mum, you may not get to have pretty pink things around the house or the choice of not having bogeys wiped on you but we are boys, we’ve got this’ but they didn’t, they were worse than me and were both river dancing around the living room. I called Karl, he is an hour away, he can’t help and being honest was about as sympathetic as if I had just slapped him around the face with a dead fish. So I was on my own. I got a little box in the hope of putting it over the mouse and getting it out in the most humane way possible. I opened the kitchen door a tiny bit and Nate my seven year old pushed me though slamming the door shut behind me. Like when they lock you in the room on the Crystal Maze and Just stand outside the door. These two also barricaded the door so the mouse couldn’t get out. Of course that also meant I couldn’t get out either. The poor mouse was wedged between a wooden toy lorry and a box of recycling bits (my home is never tidy) and I spent a number of minutes dancing around too scared to move anything incase it ran under the fridge. Eventually I had the nerve to move the lorry and quickly dropped the box down but not quite over the whole of the poxy thing so it was struggling to escape staring at me. I managed to sort it and then almost collapsed on the kitchen floor. I then had to push some card under the box and get the mouse out of the house, around the toy assault course and avoiding Alf who was prowling around unhappy I had screamed at him. I released the mouse (a wood mouse I have identified from google) and then both boys appeared with some cheese. I have no idea what the cheese was meant to do but Nate seemed happy that he could just eat the cheese and they carried on as if nothing had happened. I may be making a huge meal out of the whole incident but I don’t do pests, I don’t catch things and I certainly don’t stay calm in situations that involve any of them. You should see me if a wasp flies at me, it’s like watching that episode of Friends where Pheobe likes to run. Anyway today I have learned that I can manage totally on my own, the boys need some better training, I may need to pay for my friend to have hearing aids and that wood mice are very cute as long as they aren’t leaping around your kitchen.